 The Filipino-American Law Enforcement Officers Association (FALEO) was established to promote fraternal relationships and cultural awareness amongst all members (Sworn and Non-sworn) in law enforcement. To that end, FALEO is committed to supporting cultural, educational, recreational, and charitable services within our Communities. 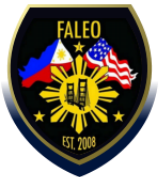 Since our existence in 2008, and through the good will of our members, FALEO has provided goods, services and training to our law enforcement counterparts in the Philippines on most an annually basis. This spirit of giving has earned FALEO the recent prestigious Geny Gawad Lopez Samahang Bayanihan Award for 2010. Members of FALEO provide training and presentations to local schools, communities both public and private on various subjects ranging from personal safety to ID Theft. Additional activities include voluntary feeding of seniors during the holiday season, annual picnics “pot luck” tradition to which all friends and relatives are invited to attend. In 2011 and 2012, FALEO provided scholarships to undergraduate students requiring financial assistance in behalf of Officer(s) Nick Birco of the San Francisco Police Department and Perlita Mendoza Becker, private donor . Fellowship awards also provided on behalf of Officer Bryan Tuvera to FALEO law enforcement members wishing to enhance their careers in public service within our communities. This is a partial representation of what FALEO envisions for its community and law enforcement colleagues, friends and families. All Executive Board and Board of Directors serve on a volunteer basis and without compensation of any kind. FALEO is a non-profit, charitable and tax exempt organization under 501(c)(3) of the Internal Revenue Service Code and under 23701d of California Revenue Service Code. This corporation is organized exclusively for one or more of the purposes as specified in Section 501( c ) ( 3 ) of the Internal Revenue Code, including, for such purposes, the making of the distributions to organizations that qualify as exempt organizations under Section 501 ( c ) ( 3 ) of the Internal Revenue Code. Your donation(s) may be tax deductible to the extent allowable by law. Your donations will be acknowledged by return letter or kept anonymous as per your request. Please let us know. Thank you so much / Maraming Salamat Po!! Shop at any of our 150+ online retailers, including Amazon, and we receive a contribution for every purchase! ​"Any printed material, books, magazines or journals produced other than from FALEO's newsletter, or published News articles are considered as "Not Official" by FALEO unless bearing the seal of FALEO and/or notice indicating endorsement by its Executive Board and Board of Directors."